What does it take to enact a law in the USA? In a country with a parliamentary system, a Prime Minister is chosen by the party with a majority in parliament, or by a coalition of parties if none of them has a majority. The Prime Minister then proposes laws and normally they are enacted by parliament. If parliament rejects an important bill, the Prime Minister has the option to call an election, and let the people decide which they think is right. Here in the United States, the process is different. In order to become law, the Affordable Care Act has to get a majority of votes in the House of Representatives and 60 out of 100 votes in the U.S. Senate. It then had to be signed by the President and reviewed by the Supreme Court. It seems to me that, whether or not you agree with the law, that ought to be enough. Hat tip to Buffalo News. Update: President Obama signed a law providing for continuation of pay of active-duty military personnel. But now the Republicans in the House of Representatives are threatening to shut down the government unless the Obama administration delays implementation of the health care act. They don’t have the votes to repeal the law, so they are using a blackmail tactic instead. 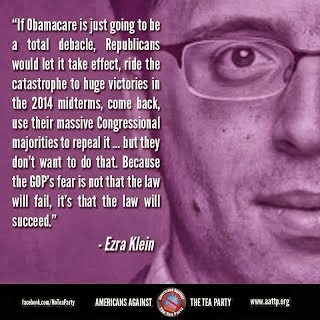 In my opinion, Obamacare is a flawed plan which is unlikely to work as intended. But it is law, and millions of individuals and thousands of businesses have made plans based on the schedule for implementing it. Shutting down the government would be harmful to the country, but there would be even more harm from the economic uncertainty created by doubts as to whether a law really is law even after it is enacted. 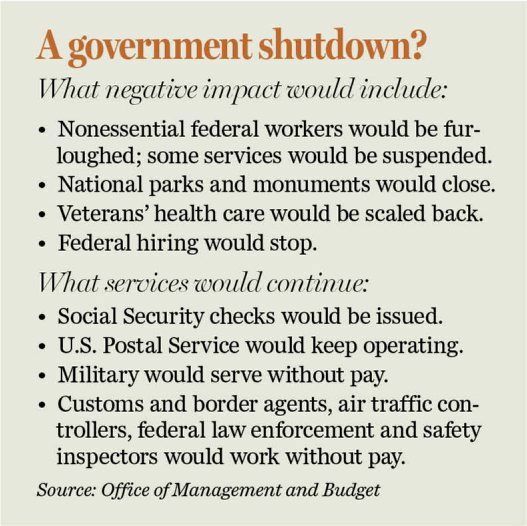 Granted, there are worse things that could happen than a temporary shutdown of government. But it creates unnecessary disruption, unnecessary hardship and also unnecessary expense, because it is more costly to shut down and restart than to continue operations. It is terrible way to run a government. 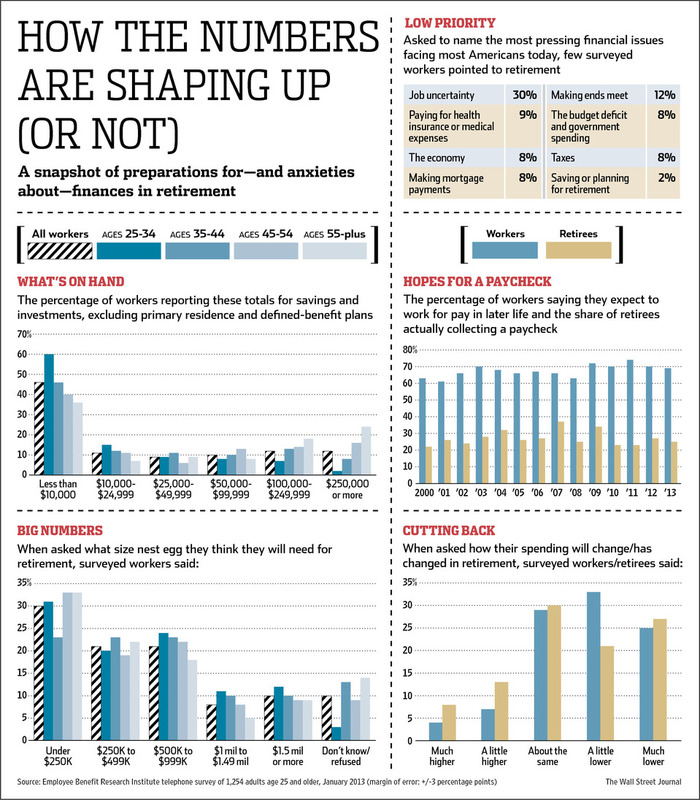 Expand Social Security infographic via Democracy for America. Click on Even when you do everything right, life happens for a case study by “Digby” on Hullabaloo. The video is taken from a larger documentary entitled Always / Never: the Quest for Nuclear Safety, Control and Survivability, produced in 2010 by Sandia National Laboratories for internal use only and never officially released. The incident in which an atomic bomb nearly exploded over Goldsboro, N.C., in 1961, is recreated through computer animation. This video excerpt was published by The Guardian. Click on U.S. atom bomb detonation was averted ‘by the smallest margin of chance’ for The Guardian’s report on the video by Ed Pilkington. Click on America’s biggest threat is its own N-weapons for my earlier post on nuclear near-disasters. This is a dilemma. I don’t advocate unilateral disarmament. I don’t want the United States to be in a position in which other nations could attack us with impunity. But this puts Americans in danger of accident nuclear explosions and even accidental nuclear war. We will not be safe until there is general, enforceable nuclear disarmament among all nations, and this will not happen until no nation that possesses nuclear weapons or has the capability of possessing them is free of the fear of being wiped out. This is a radical hope, but the present situation cannot go on forever. Bill Moyers interviewed Kumi Naidoo of Greenpeace on his show Friday. The interview is worth watching both as an informative discussion of an urgent problem and as a portrait of a remarkable and charismatic individual. The following is Moyers and Company’s description of the show. As of this moment Vladimir Putin’s government is holding in custody the Arctic Sunrise, the command ship of the environmental activist organization Greenpeace International. The ship was seized by armed members of the Russian Coast Guard on Sept. 19 after Greenpeace activists tried to board an offshore oil platform as a protest against drilling for fossil fuels in the fragile environment of the Arctic, where global warming has reduced the sea ice cover 40 percent since 1980. From his teenage years in South Africa, Naidoo was a vocal and powerful opponent of apartheid, incarcerated and beaten so often he finally fled to Britain, where he was awarded a Rhodes scholarship to Oxford. When apartheid ended, Naidoo went back to South Africa and became a prominent human rights activist with a growing concern for the impact of climate change on impoverished people of color. In 2009, he brought his negotiating and advocacy skills to the leadership of Greenpeace International, now a worldwide organization of three million members. Click on BBC News for more about the oil drilling protest in the Russian Arctic. Hat tip for the video link to Jack Clontz. General Wesley Clark said that, shortly after the 9/11 attacks, he was told by a friend in the Pentagon that the Department of Defense had a list of seven countries it intended to invade—Iraq, Syria, Lebanon, Libya, Somalia, Sudan and Iran. Donald Rumsfeld, Paul Wolfowitz and the other architects of that plan are no longer in government, but it does seem as if that, at any given time, the United States government is debating war with one or another of the countries on that list. Juan Cole is optimistic about peace negotiations with Iran. I hope he’s right. There is no basic conflict of interest between our two countries. We Americans of course would like to have cheap oil, but no Iranian government is going to give its oil away. Even the Shah of Iran, who was installed by the CIA, eventually nationalized Iranian oil and supported OPEC. How Bashar al-Assad Destroyed My Country by Omar Ghabra for The Nation. A Syrian-American recalls how the Assad government in 2011 murdered and tortured non-violent protesters who demanded a democratic government and respect for human rights. His article illustrates President John F. Kennedy’s saying, that those who make peaceful revolution impossible make violent revolution inevitable. Evidently Russia supplied the poison gas weapons, but essential chemical supplies also came from Germany and other European countries. Putin to the Rescue by David Bromwich for the London Review of Books. 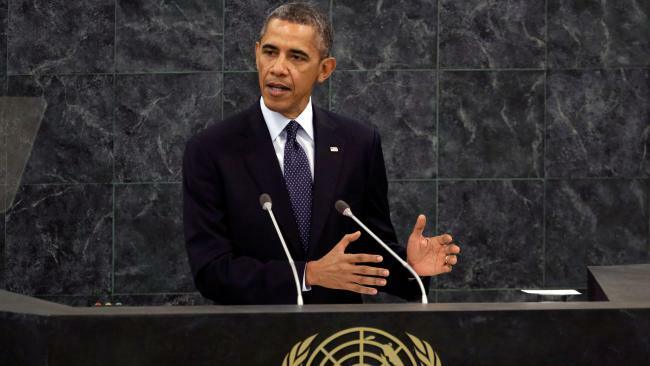 Barack Obama thoughtlessly says things that come back to haunt him. That’s one reason the wily Vladimir Putin outsmarted him in the Syrian crisis. You would think that someone who is as determined as President Obama to prevent leaks of embarrassing information would be more self-disciplined about his own words. Seymour Hersh on death of Osama bin Laden: ‘It is one big lie; not one word of it is true’ by Lisa O’Carroll for The Guardian. Hat tip to Daniel Brandt. Investigative reporter Seymour Hersh is my age (76) and still going strong. People like him make me feel as if I’ve wasted my life. Uzbekistan’s Karimova Tillyaeva reveals rift in ruling family by BBC News. Hat tip to Oidin. The jet-setting daughters of Uzbekistan’s dictator Islam Karimov, who both play roles in the government, haven’t spoken to each other for 12 years. As celebrity gossip, this is amusing, but I don’t think that the poverty-stricken, repressed people of Uzbekistan find it so amusing. HIyao Miyazaki, the great Japanese animator, announced earlier this month that he intends to retire from making feature-length films. I’m sorry to hear that, but I’m not too disappointed, because there are so many of his films that I haven’t yet seen. He is a great storyteller with a great visual imagination. The trailers I’ve included in this post hint at it, but don’t fully show it. His stories are exciting and full of derring-do, but they generally end with reconciliation and never with the annihilation of the losing side. Spirited Away, whose trailer is shown above, is about a little girl who finds herself trapped in a sort of vacation resort for supernatural beings. It is highly imaginative, and yet, for me, evokes the feelings of a young person on their first job—having to do things that seem impossible, being subject to the whims of powerful, unreasonable beings, and somehow figuring out how to adapt and function well. Click on Hayao Miyazaki for his Wikipedia biography. Click on Hayao Miyazaki to retire, his real reasons for leaving anime in the Asahi Shimbum for background on his retirement. Congressional Republicans are threatening to shut down the government unless Obamacare is defunded. 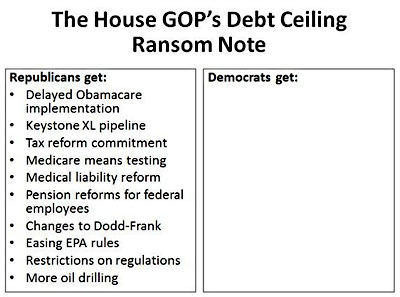 But the real danger to the government’s functioning, as blogger Steve Benen pointed out, is the refusal of the Republicans to raise the debt ceiling unless their demands are made. These demands are shown in the graphic above. These demands are basically the Mitt Romney presidential platform, which the American electorate rejected a year ago. All of them, in my opinion, are bad for the country. But if I’m wrong about that, then let the proponents enact laws through the regular lawmaking process. The fact that the Republicans have a majority in Congress at all is due to the way congressional districts are drawn. Democratic congressional candidates last year got a million more total votes than Republican candidates. I don’t know what the effect of refusing to raise the debt ceiling would be. 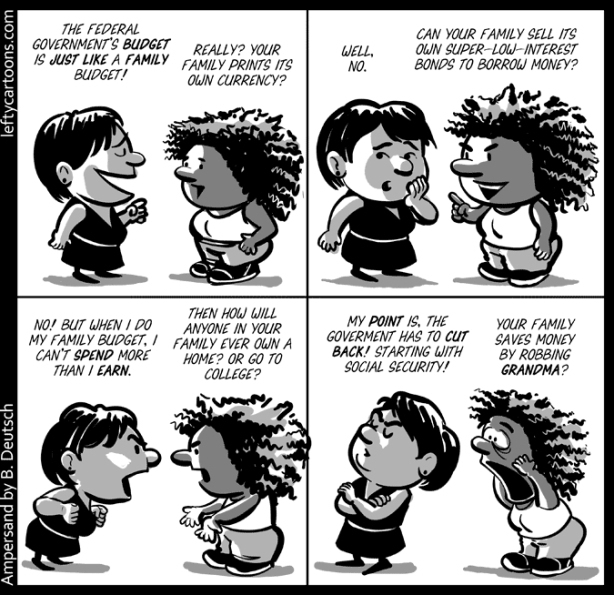 It seems to me that the Federal Reserve Board could solve the problem by creating money to buy up the excess debt. Maybe this would set a bad precedent. In any case, I don’t expect this to happen. One of the big assets of the United States is the world’s confidence that our government debt will be repaid. To the extent this is damaged, it could add untold billions in the government debt service costs and maybe even undermine confidence in the U.S. dollar as the world’s reserve currency. Risking this is deeply irresponsible. The criticism that is made of President Obama is that he refuses to compromise. But the ordinary meaning of the world compromise is to give up something in order to get something in return. There is no question of compromise here—only the question of whether and to what degree he will give in to threats. Six years ago, we had the same political situation that we do now, in reverse. Republicans occupied the White House and had a majority in the Senate, Democrats had a majority in the House of Representatives. Congressional Democrats never threatened to close down the government or damage the credit rating of U.S. Treasury bonds in order to get their way. Nor, for that matter, did Senate Democrats insist on a 60-vote majority for routine business. When I studied political science in college in the 1950s, I was told of the superiority of the pragmatic American political culture to the ideological French and Italian political parties, who pushed ideology to the limit regardless of consequences. 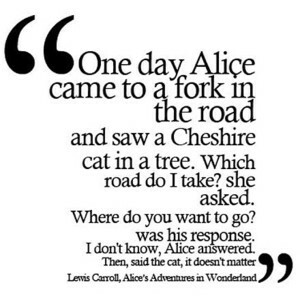 But that was then. This is now. Click on Breaking Up With Occupy for an article about Nathan Schneider’s interviews with Occupy Wall Street protesters two years later and his reflections on the legacy of the movement. Schneider, one of the first journalists to cover the Occupy Wall Street movement, and Mark Bray, Occupy Wall Street’s press liaison and one of its first organizers, will take part in a panel discussion sponsored by Rochester Red and Black at 5 p.m., Sunday, Sept. 29, at the Flying Squirrel Community Space, 285 Clarissa St., Rochester N.Y.
One of their topics will be anarchism and Occupy Wall Street’s non-hierarchical system of decision-making and organization. The American people have no desire to send U.S. troops into more foreign wars, so the U.S. government is arming Syrian rebels to serve as our proxies for overthrowing the rule of Bashir al-Assad. By channeling arms to the “moderate” rebel forces, the Obama administration hopes to prevent Assad from being replaced by radical Al Qaeda jihadists. As Pepe Escobar wrote in his latest column for Asia Times, the problem with that is the troops aligned with Al Qaeda are the fiercest fighters, and they’re getting all the weapons and support they want from the Saudi Arabian government. They also are working to overthrow the Shiite government of Anwar al-Maliki in Iraq. 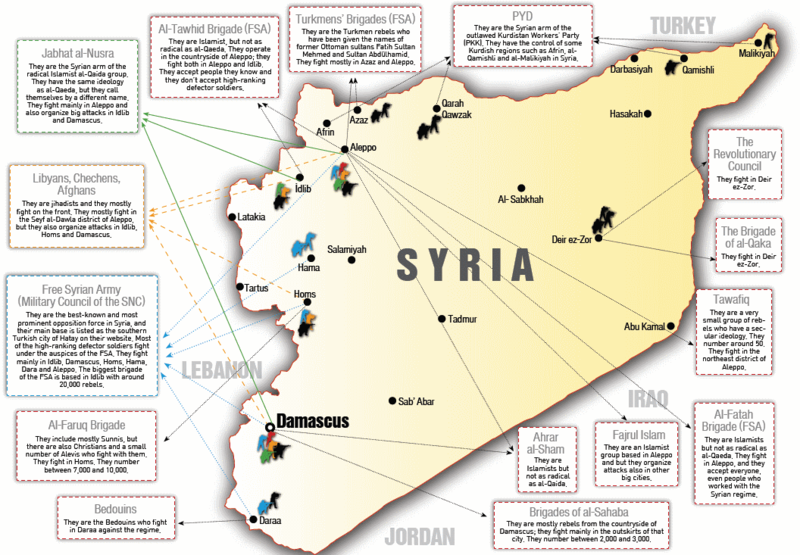 A possible result of the Syrian rebellion is two new governments aligned with Al Qaeda—Syria and Iraq. Such governments, unlike the Saddam, Qaddafi and Assad regimes, really might be a threat to Americans—not to the existence of the United States, but to us Americans as individuals. This is another good reason for the U.S. government to make peace with Iran and form an alliance against Al Qaeda. Another example of bad consequences of a proxy war is given by Ian Welsh (whose web log is the newest addition to my Blogs I Like links page). He wrote about how the attack by Muslim terrorists on the Nairobi Mall in Kenya was blowback from a U.S.-inspired Kenyan invasion of Somalia. I am reminded of Adam Smith’s comment about how masterminds who think they can manipulate other people like pieces of a chessboard forget that the chessmen are playing their own games, which may be different from what the mastermind intended. I think there are two good rules for the United States for intervening in foreign wars. Don’t arm our avowed enemies. Don’t attack people who are not our enemies. Private pensions are becoming a thing of the past. Very few young Americans enjoy a secure retirement as I do, based on Social Security, a company pension and personal savings. Now public employee pensions are going the same way as private pensions. Matt Taibbi has an excellent report on this in Rolling Stone. He wrote that the downfall of public employee pensions came in six steps. State and local governments offered generous pensions, sometimes in lieu of pay increases. Many of them failed to make their Annual Required Contributions to the funds which, as Taibbi noted, is financial fraud if unreported, because it means that governments are less solvent than buyers of state and local government bonds are led to believe. Many of them solved short-term financial problems by borrowing from their pension funds. All this came crashing down in the financial crash of 2008. Wall Street hucksters promised state and local governments that they could get higher returns by putting the pension funds into high-risk investments. Huge fees were paid to fund managers, but the high returns haven’t materialized. The proposed solution is to give firefighters, police officers and school teachers less than they were contractually promised. Public pension fund would be in better shape if they had simply invested in U.S. Treasury bonds or on low-fee stock index funds. Instead pension funds were turned over to managers to charge exorbitant fees for speculative investments that in the long run underperformed the market. Now, Taibbi wrote, public employees are being made to suffer for mismanagement by the trustees of their retirement funds. Maybe it will have to come to that, he wrote, that should be a last resort, not a first resort. Before that, local government should end corporate subsidies and try to claw back the excessive fees. In 1976, Peter F. Drucker, then considered a top business thinker, wrote a book entitled How The Unseen Revolution: Pension Fund Socialism Came to America. He said that workers in the United States in effect owned the means of production because of the stocks and bonds owned by their pension funds. The title was an exaggeration. Pension funds only owned about 16 percent of publicly traded stocks and bonds, measured by market value. But Drucker thought that pension funds would become more and more important, and the interests of workers would become more and more aligned with investors and holders of financial assets. 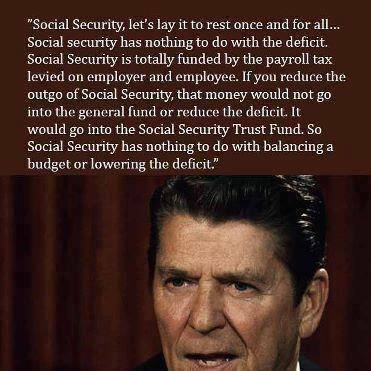 That didn’t happen, because the workers did not in fact control the pension funds. It is interesting to speculate what would have happened if they had leveraged their financial power to influence corporate policy. It is interesting to speculate on what would happen if they did so now. Click on Looting the Pension Funds: How Wall Street Robs Public Workers for Taibbi’s full article. I didn’t do justice to it, and it is worth reading in its entirety. Taibbi is a first-rate investigator and clear and eloquent writer. Click on Who Rules America: Pension Fund Capitalism for a debunking of the Drucker thesis (which I admit I took seriously at the time) by G. William Domhoff. Americans are in greater danger from accidents in our own country’s nuclear arsenal than we are from the spread of nuclear weapons to countries such as Pakistan, North Korea or Iran. In the period from 1950 to 1968 alone, he discovered 700 “significant” nuclear accidents. The government was uncooperative, but he was helped by whistleblowers who were worried about lax handling of dangerous weapons. 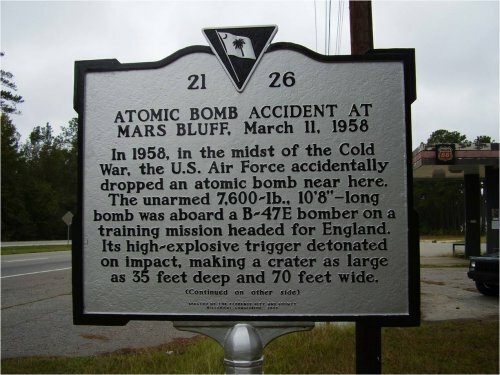 An atomic bomb without its warhead was accidentally dropped on Mars Bluff, S.C., in 1958. 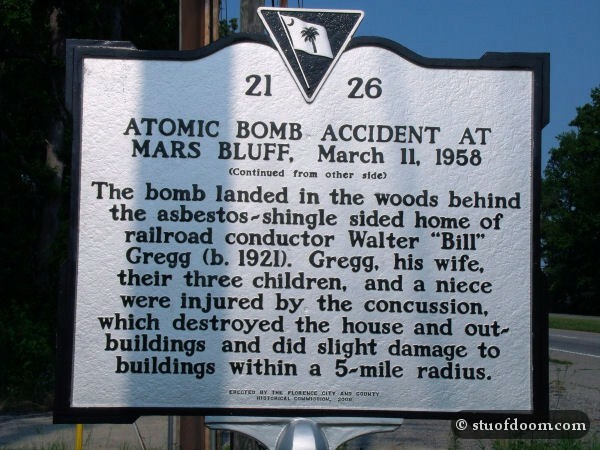 A fully armed atomic bomb was dropped near Goldsboro, N.C., in 1961; there were four fail-safe switches designed to prevent the bomb from going off accidentally, and three of the four failed. Suppose you were President of the United States and you were told that an atomic bomb had been dropped on North Carolina. Would you stop and do nothing until you figured out what had happened, or would you assume that the nation was under attack and strike back. The Cold War is over, but both the United States and the Russian Federation still have their nuclear missiles ready to launch, and an nuclear false alarm is just as possible now as it was then. I don’t know which is worse—to think, as Schlosser does, that the U.S. Air Force is negligent in its handling of nuclear weapons, or to think that the current system is working as well as is humanly possible. The Affordable Care Act does good things. It extends health insurance to many (but not all) of the uninsured. It forbids denying people health insurance because of a pre-existing condition. Young people can be covered by their parents’ health insurance for longer periods of time. The big problem with the law is its complexity. Generally speaking, government is a good mechanism for doing simple, clear-cut things, and a bad mechanism for doing complicated things. Obamacare is hard to implement, as is seen in all the delays and exemptions in rolling out implementation. As a candidate, Barack Obama proposed a simple, workable public option. A public option would be a self-financing government health insurance system that people could join if they couldn’t get private insurance or weren’t satisfied with their current insurance. It didn’t require micro-managing the whole U.S. health care system. But that would have been a threat to the for-profit health insurance industry. For whatever reason, Obama quickly abandoned his plan when he was sworn in as President. Obamacare does nothing to address the reasons Americans pay so much more for medical care than foreigners do. It disallows the government negotiating with drug companies for lower drug prices, as foreign governments do. It locks in for-profit health insurance, which would play no useful role in a universal health care system. And it does not address the fact that physicians and other specialists have much higher incomes than in foreign countries. As with some of the President’s other initiatives, it leaves me in doubt as to which side he is on. 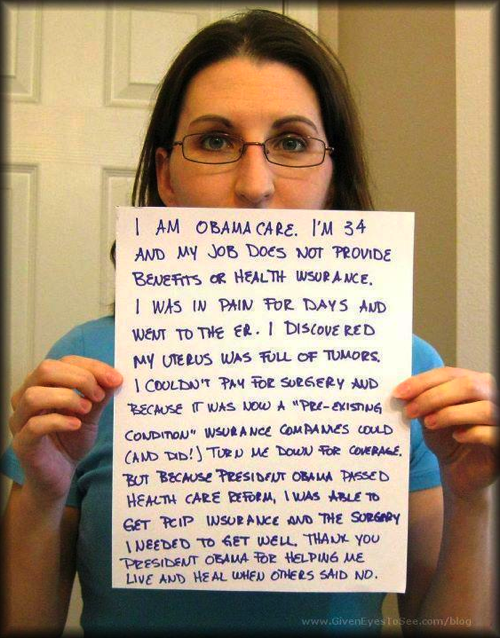 I agree that some of the reasons for opposing Obamacare are bogus. Employers blame the Affordable Care Act for layoffs and downgrading jobs from full-time to part-time, but I think most of that would be happening without the law. The best result for Obamacare would be that it results in a net improvement, with the possibility of further piecemeal improvement. The worst is that it would leave many people worse off than before, and discredit the whole idea of universal health care. I fear Obamacare will be a big unwieldy mess, which ordinary people won’t understand and which the insurance, drug and medical industries can manipulate to their own advantage. But I’m not sure I’m right about this, and I hope I’m wrong. 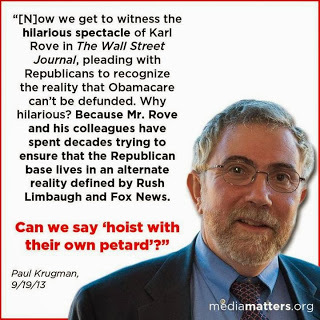 Click on The GOP’s Self-Defeating ‘Defunding’ Strategy for Karl Rove’s article in the Wall Street Journal. 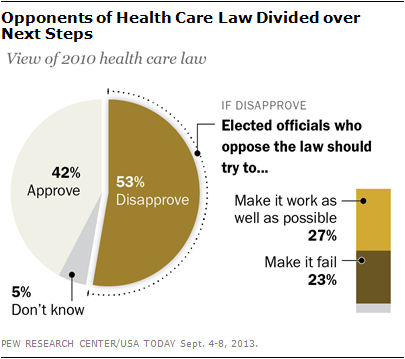 This opinion poll by Pew Research indicates that more than half of the opponents of the Affordable Care Act think that elected officials should try to make it work as well as possible rather than sabotaging it and making it worse. Some time back I saw a public opinion poll that indicated that some of the opponents of Obamacare oppose it because (like me) they would prefer a single-payer system (Medicare for everybody) or a public option as a voluntary alternative to private insurance. I wasn’t able to find the poll in a Google search. What I’d be interested in seeing is a current poll of the opponents of Obamacare giving a breakdown as to (1) those who oppose it because they think it won’t provide affordable health insurance to the currently uninsured and (2) those who oppose it because they are opposed in principle to the government spending money to give people medical care. I’d also like to see a breakdown of opponents who would like the government to (a) do more or (b) do less. But whatever Americans think of the Affordable Care Act, a majority disagree with shutting down the government or risking a default on government in order to prevent it from being implemented. Click on What Republicans don’t understand about the politics of Obamacare for more from Ezra Klein on the Washington Post’s Wonkblog. 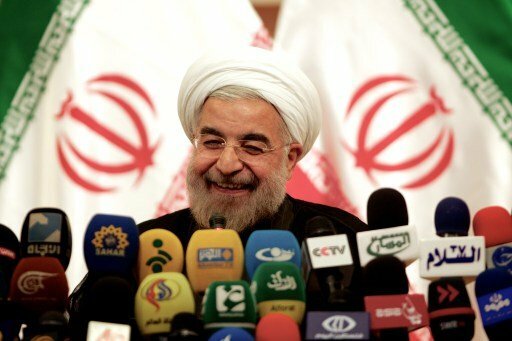 Iran’s President Hassan Rouhani has offered President Obama a chance to end the 34-year U.S. cold war with Iran, turn the United States away from perpetual warfare and retroactively justify his Nobel Peace Prize. He has an opportunity to do what President Richard Nixon did when he established diplomatic relations with Communist China, and what President Ronald Reagan did when he negotiated an end to the U.S.-Soviet cold war. Even though the initiatives came from Zhou Enlai (Chou En-Lai) and Mikhail Gorbachev, there would be been no peacemaking but for Nixon and Reagan. Barack Obama’s path to peace will be more difficult than either of theirs. For one thing, he is a Democrat, and most Democratic leaders think they have to be belligerent to disprove Republican charges that they are weak. For another, he has to overcome a military-industrial and foreign policy establishment that is committed to war, and lobbyists for Israel and Saudi Arabia, based respectively on their strong ethnic ties and strong financial ties to the United States. The stumbling block is Iran’s nuclear enrichment program. The Iranian government says it is using nuclear energy for peaceful purposes, including medical research, which it is legally entitled to do. The Ayatollah Khamenei says that nuclear weapons are immoral and contrary to Islam; I don’t think a religious leader would say such a thing unless he meant it, because, unlike with politicians, people take the statements of clerics seriously, and he would be completely discredited if he was shown to be lying. Some analysts think that Iranian leaders don’t want nuclear weapons, but they want the capability to develop nuclear weapons at some time in the future if the situation warrants. This desire seems reasonable to me. Iran is surrounded by countries with nuclear weapons – the United States, Russia, China, India, Pakistan and Israel. Naturally an responsible Iranian leader would want some deterrent against attack. I think adherence to the Non-Proliferation Treaty would provide a basis for peace. This asks countries that do not possess nuclear weapons to refrain from acquiring them, and promises them in return that they will receive help in developing nuclear power for peaceful purposes and that the countries with nuclear weapons will take steps to get rid of them. Click on Ted Rall’s Rallblog for more from this cartoonist. Paul Buchheit calculates that the average American family pays extra taxes amounting to $1,270 a year in extra taxes to offset corporate tax havens, $870 to offset special corporate tax benefits, another $870 to pay for in direct corporate subsidies and grants, $696 to offset state and local government business “incentives” and $722 to offset subsidized interest rates in loans to Wall Street Banks. The average family also pays $1,268 a year extra for monopoly-priced drugs, compared to what foreigners pay in a free market, and $350 a year in unnecessary frees for tax-advantaged retirement plans. None of this would exist in a well-functioning free-market economy. China’s Ultimate Debt Holders—Not the Borrowers by Sara Hsu for Triple Crisis. Cross-posted to naked capitalism. A recession looms in the Chinese economy, which means many of the loans by Chinese banks won’t be paid back. Economics professor Sara Hsu writes that they are securitizing the loans (selling them like stocks or bonds) with the Chinese government as buyer of last resort. This is a familiar pattern of rescuing the “too big to fail” banks while abandoning the “too small to save” debtors and unemployed workers. Unfair Share: How Oil and Gas Drillers Avoid Paying Royalties by Abrahm Lustgarten for ProPublica. Unethical oil and gas drillers have many techniques for avoiding payments to landowners. Often they make deductions from royalties for unexplained or bogus expenses. Oil and gas leases are frequently bought and sold, and sometimes the landowner doesn’t even know whom to contact for payment. Obama’s Friends in Low Places by Robert Scheer for Common Dreams. Why pharma’s patents are a drug on the market by Dean Baker for The Guardian. Click on Leftycartoons for more Barry Deutsch cartoons. Hat tip to Tiffany’s Non-Blog. Hat tip to The Big Picture. When I learned geography in school, our maps for the Mercator projection, in which the lines of longitude are the same distance apart, all the way from the North and South Poles to the Equator. This makes Greenland look larger than Africa, and islands in the Canadian north seem larger than important South American countries. 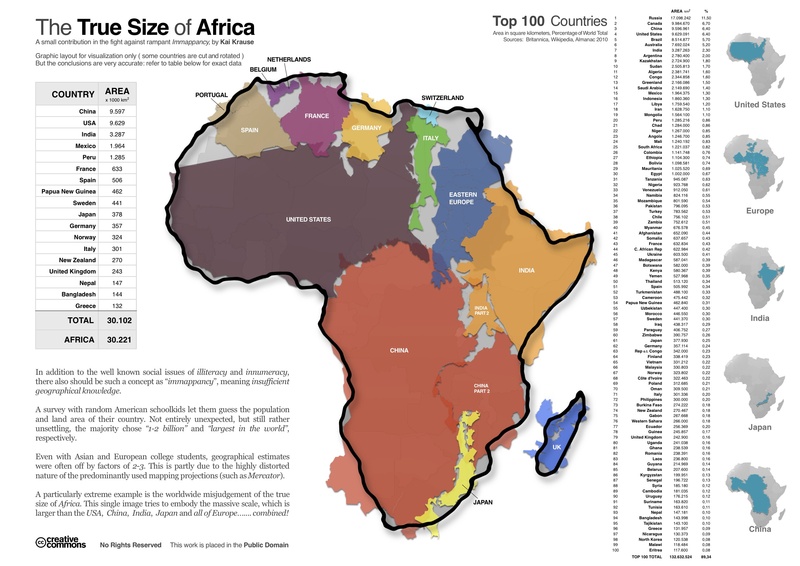 I knew this wasn’t so, but this map helps me to grasp just low large the continent of Africa is. Africa is not all one country. It is made up of many nations that are at least as diverse as Europe, even if you only look at the countries south of the Sahara. I don’t know much about Africa, but I do know that much.